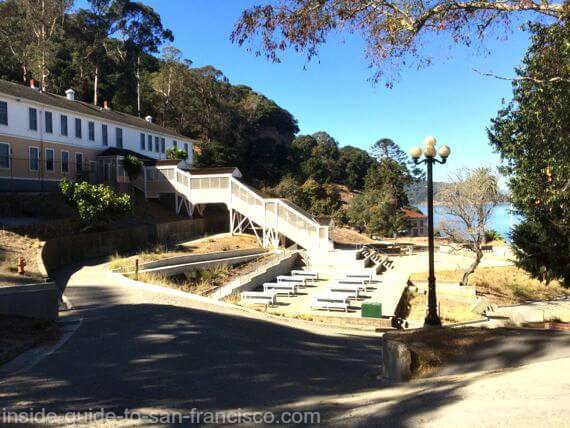 Angel Island, San Francisco: Beautiful Sanctuary in the Bay. Angel Island is one of those wonderful San Francisco Bay "attractions" that every one knows about (it's a big island, right there in the middle of the bay) but surprisingly few people get around to visiting it. I was guilty of that, too. When I finally got out to the island, I was amazed at how lovely it was! Don't miss it, if you've got the time. What's Out There on the Island? Angel Island has been a state park since 1962, with miles of hiking trails and abandoned buildings scattered here and there, left over from military uses starting during the Civil War and continuing through World War 2. It also housed the Ellis Island of the West, the United States Immigration Station for would-be immigrants arriving across the Pacific Ocean, now a museum. The island's main attraction is its incredible beauty and tranquility. So close to San Francisco, but so peaceful and relaxing. And easy to get to. 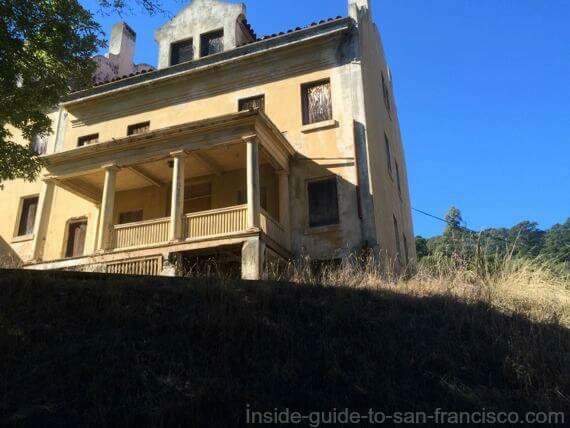 There's a lot to do on Angel Island; in fact, it can't all be "done" in one day. Fortunately, you can have a great time without seeing and doing it all. There are activities tailored for everyone's level of fitness and time restraints. Feb, Mar & Nov: weekends only. Hours vary somewhat seasonally; see Angel Island hours. When to go? September and October are some of the best months to go, weather wise: warm, sunny and clear. This is the main "Angel Island Tour". If this is your first time out here, I would highly recommend taking it. An open air tram leaves from the dock area twice a day, and takes you all the way around the island. There is a recorded narration which gives you the history of the island and explains the sights you are passing, and the driver adds more information at various brief stops along the way. Tickets. The tour costs $16.50 for adults, $15 for seniors (65 and over) and $10.50 for children (12 and under), and lasts one hour. The tram tickets are sold at the cafe on the dock. Hours. There are two tours a day, at 11:45 am and 2:00 pm. The tours run every day, except for February, March and November, when they run Saturday and Sunday only. October tours are at 11:45 am Monday and Tuesday, and at 11:45 am and 2:00 pm the other days. Tip: Groupon often has steeply discounted tickets for the tram tour. Check here for current deals. Practical Tip: the best seats on the tram are those in the first carriage, and on the right side of the tram. The tram goes counter-clockwise around the island so the view side is the right side, much easier for taking photos. Also, you can hear the commentary better in the first car. 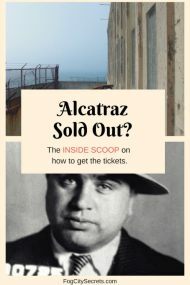 There is a sign post near the cafe at the dock telling you where the line starts; get in line around five or ten minutes before the tour starts to get a good choice of seats. This is the other Angel Island Tour. 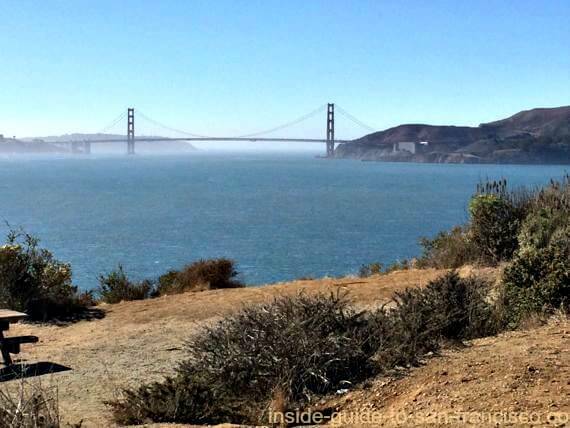 The Segway Angel Island Tour is $68 per person, at 10:30 am and 1:00 pm daily. Lasts two hours. Long pants and closed-toed shoes required, no shorts or skirts. Age 16 and over. 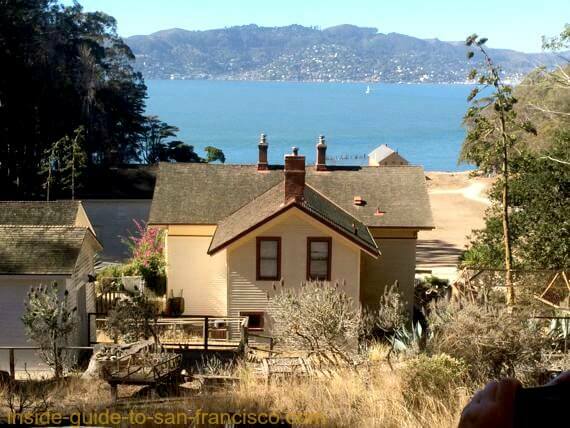 You can book it through the Angel Island website. This island is truly a hiker's paradise. 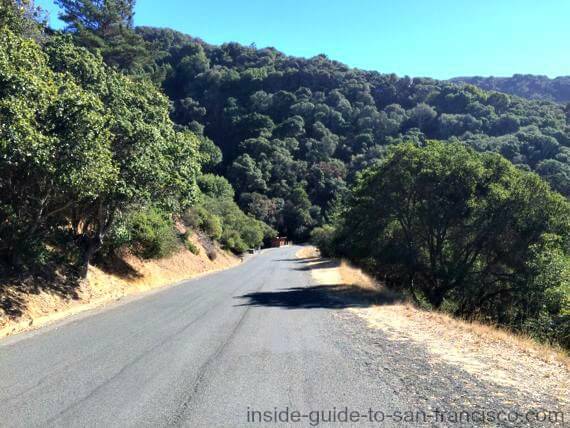 You can walk all around the island on the paved perimeter road, or take one of the two hiking trails to the top of Mount Livermore, at 700 feet above sea level. The view at the top is spectacular: 360 degrees and you can see Mount St. Helens on a clear day! The up and down takes about three hours and is moderately challenging; there are some steep areas, and the hike is better suited for those in reasonably good condition and accustomed to hiking. The perimeter hike is 5 miles and not as challenging, but does have some long hills. You can bring your own bike on the ferry or rent a bike at the dock. They rent for $15 per hour, or $60 for the day. They say it takes about an hour to ride around the island. The bikes can't be reserved: first come, first served. I was considering renting a bike until I saw the hills; they do warn you there are several steep hills on the perimeter road where the biking takes place (no off-road biking allowed here). I would say the biking is for those who are in top biking condition. 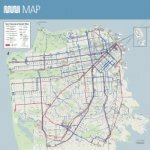 I was picturing a leisurely ride on a mostly flat road around the island, with a few steep spots; nope, that's not what it is. I saw someone pushing her bike up the long grade below; she didn't look very happy. Not my idea of fun! So plan accordingly. This is just one of the steep hills; there are several. Good news! They now have electric bikes for rent. Hills? No problem. $25 per hour, $90 for the day. No reservations; first come, first served. You can spend the night here. What splendid isolation and peace! There are 11 campsites on the island; all sites have running water, tables, lockers, toilets and a BBQ. Only stoves or charcoal are allowed (no wood fires). Tip: put your food in the lockers. Raccoons will be checking to see if you remembered. 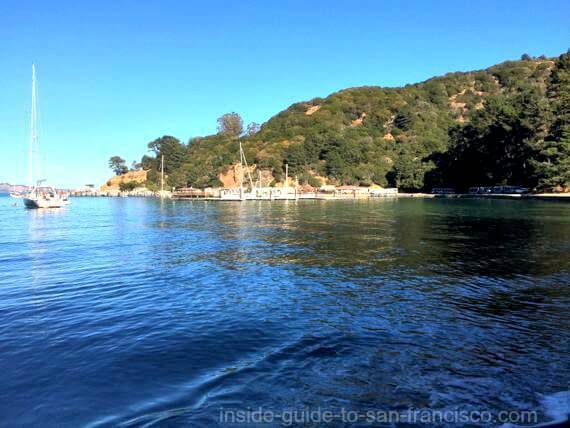 To reserve a campsite, see Angel Island Campsites. 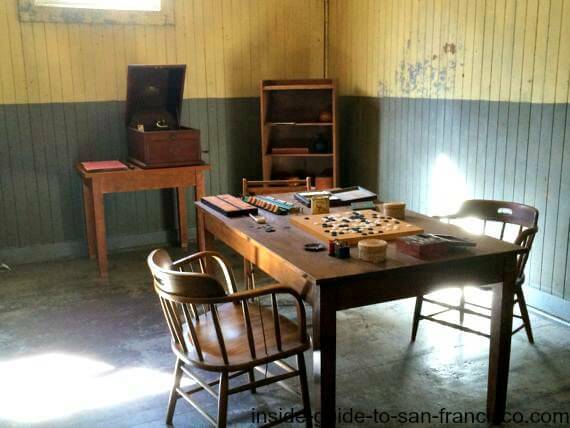 Aside from the physical beauty of Angel Island and the views, there are two main things to explore on the island: the Immigration Station Museum and the abandoned military buildings. This immigration station (often referred to as the Ellis Island of the West) was the entry point for immigrants coming from the East, across the Pacific, mostly from Asia. It processed potential immigrants from 1910 to 1940, and also was used to hold Germans and Japanese prisoners, named "enemy aliens", during world War 2. This is one of the stops on the tram tour, towards the end of the trip. We got off the tram here, explored the museum, then walked the twenty minutes back to the dock (mostly downhill). 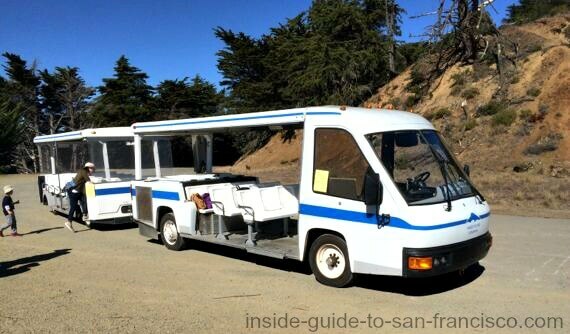 There is also a shuttle running from the cafe to the museum two or three times a day, depending on the season. 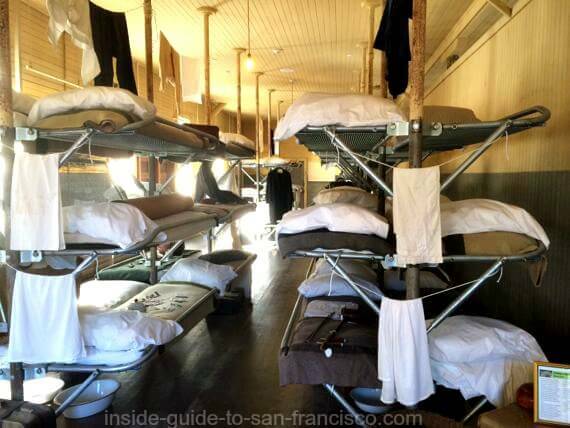 The museum ($7 entry fee for adults, open March through October) has recreated the bunk beds of the dormitories and the furnishings of one of the common rooms, outfitted with game boards and a ping pong table. In the quiet of the night, I heard, faintly, the whistling of the wind. The forms and shadows saddened me; upon seeing the landscape, I composed a poem. The sad person sites alone, leaning by a window. In December of 1939, a group of over 500 German crew members from the German luxury cruise ship Columbus were "captured" off the coast of Virginia and sent to San Francisco, to be returned home on a Japanese ship. Things went wrong when the Japanese ship wouldn't enter the bay because of the U.S. warships guarding the entrance. 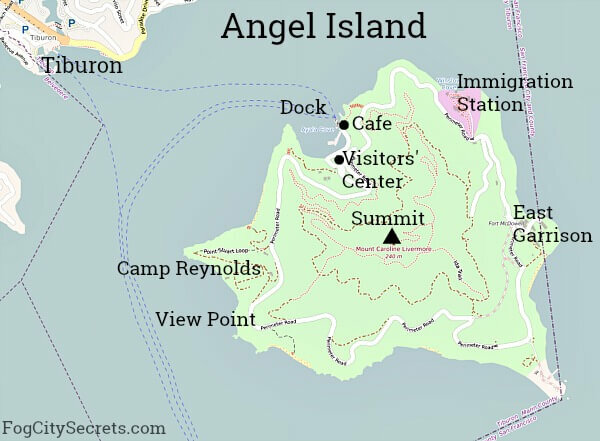 The Germans ended up being interned at Angel Island until 1941, when they were shipped to an internment camp in Roswell, New Mexico, where they spent the remainder of the war. 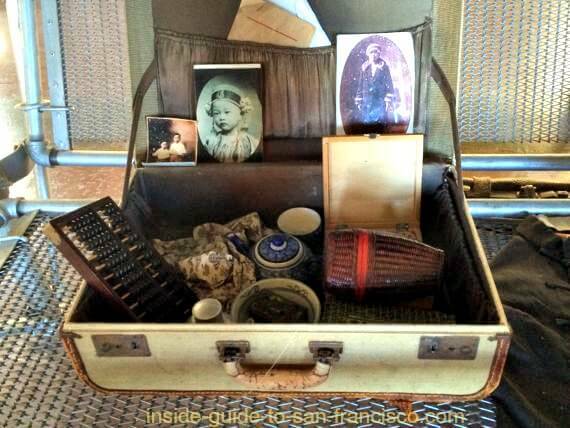 While the crew members were at Angel Island, they were allowed "shore leave" periodically and went into San Francisco for shopping, movies and other entertainment. One of the men, Alex Rolfes, managed to marry a local San Franciscan while he was here. The tram tour drives past a number of areas with empty buildings built for military purposes many years ago. First you pass the Civil War era buildings at Camp Reynolds, then further on a more extensive collection at East Garrison (Fort McDowell). My impression of these abandoned buildings is that of a ghost town in a spectacularly beautiful setting. I really wanted to come back and explore the area. There was no one around; you would probably have the buildings all to yourself (though there are warnings not to go inside because of instability). East Garrison, Fort McDowell, had the largest collection of buildings. 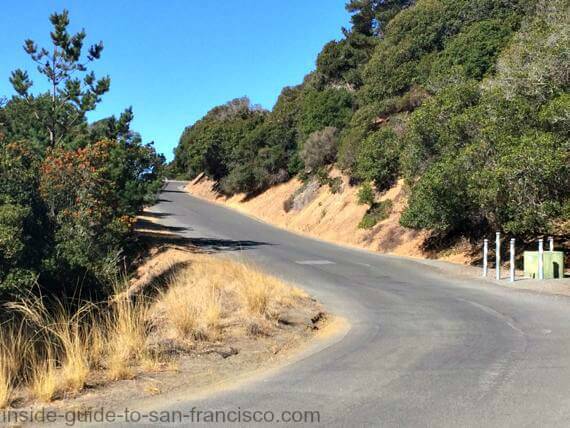 The Miwok Indians lived on Angel Island for thousands of years before the arrival of the Spanish explorers. The Miwok were hunter gatherers who hunted the wildlife and fished on the island, but didn't build any structures. By 1800, the Miwok were no longer living on the island, having been absorbed into the Spanish mission in San Francisco. The first Europeans to land on the Angel Island were the Spanish. A Spanish naval officer, Juan de Ayala, sailed into San Francisco Bay in 1775 and moored at the cove (now named after him, Ayala Cove). He gave the island its name, Isla de Los Angeles. Later, one of the Spanish officers was granted possession of the island to use for cattle ranching. During the Civil War, batteries were built on the island to defend against potential attacks from the Confederate naval vessels that were sailing up the coast (which never happened). Angel Island was long used a a troop transit area, for soldiers coming and going in the Spanish American War, and both World Wars. The island was also used to quarantine crews coming in on the ships, to avoid the spread of bubonic plague and other diseases. There is evidence that deer have been living on the island for thousands of years. They are still there, in such large numbers that they have to be hunted periodically to prevent starvation since there are no large predators on the island. The fauna are very benign; no mountain lions, coyotes or poisonous snakes have made it to the island. They do have signs on the dock warning visitors about poison oak and ticks, but that is only of concern in the more heavily wooded trails up the mountain. 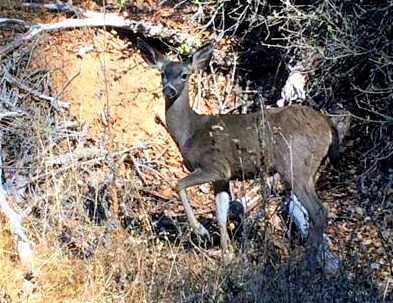 We came across a pretty, young deer not far from the cove, who wasn't particularly worried about our presence. The island is only accessible by boat. 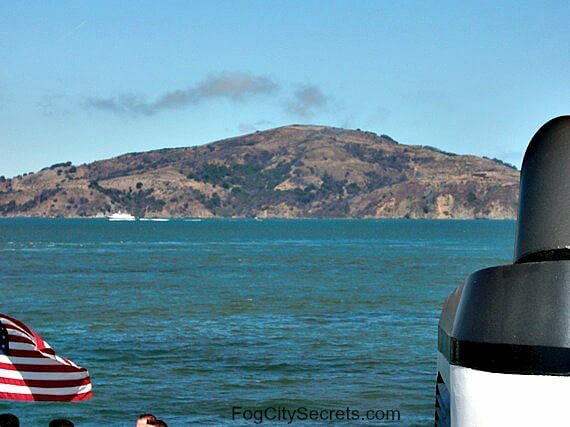 There are two ferries that go to Angel Island: the Blue and Gold Ferry from San Francisco and the Angel Island Ferry from Tiburon. The Blue and Gold Ferry to Angel Island leaves from Pier 41 1/2 at Fisherman's Wharf: see the schedule. Roundtrip is $19.50, $11 for 65 and over, and kids 5-11, and the trip lasts from 30 minutes to over an hour, depending on where the ferry stops. The Angel Island Ferry from Tiburon leaves from the dock in Tiburon, across the Golden Gate Bridge from San Francisco. Ferry frequency is seasonal (e.g. weekends only in winter). See the schedule. The trip costs $15 roundtrip, $14 for 65+, $13 for 6-12, $5 for 3-5, and takes about 12 minutes. Cash or checks only; no credit cards or Clipper cards. Pay on the boat, no reservations. 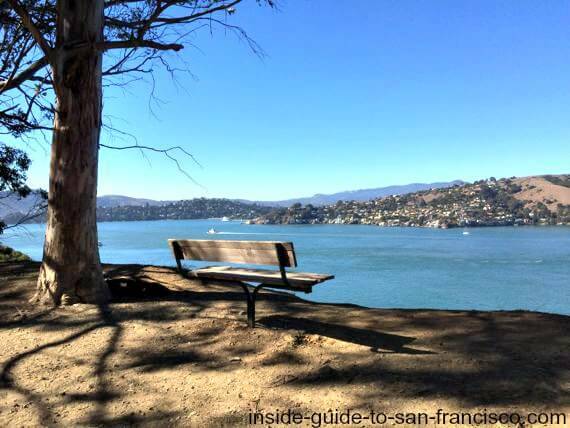 Tiburon is about a 20 minute drive from San Francisco. 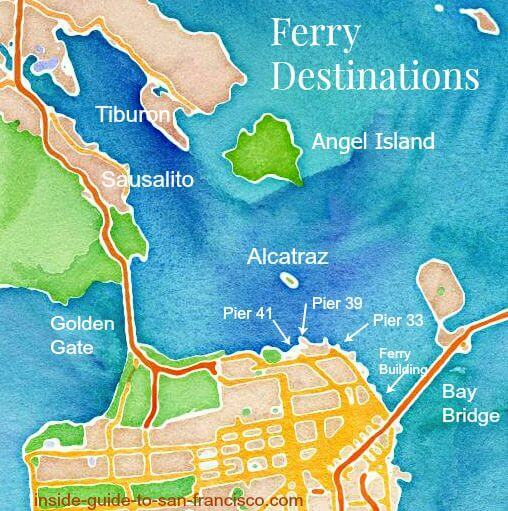 Tip: if you're coming by BART or Muni Metro in SF, you can get off at the Embarcadero stop and take a short trip on the Blue and Gold Ferry from the Ferry Building to Pier 41 ½, where you can catch the Angel Island ferry. $1.50 a ticket; who said SF is expensive!? The commercial areas in Tiburon have mostly 2-hour street parking. 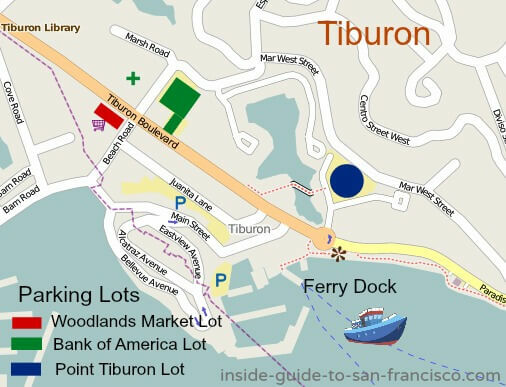 There are a number of parking lots in the town of Tiburon near the ferry terminal, some pretty cheap ($5) and one close by that's not cheap; depends how close to the dock you want to be. Woodlands Market Lot: $5 per day. Bank of America Lot: $5 per day. Point Tiburon Parking Lot: $3 per hour, $13 for 8 hours. 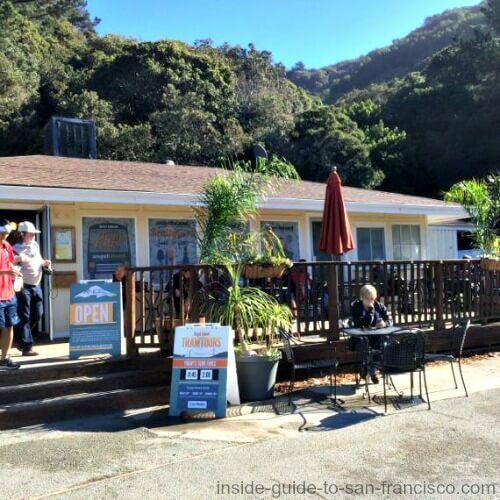 After you're done exploring, head back to the dock to the Cove Cafe. Have a hot dog, or a Caesar salad, and sit back on the patio with a cold beer while you wait for the return ferry. The perfect ending for a pleasant day on Angel Island!